Cádiz is supposed to be the oldest city of Europe. Hercules is said to have founded the city, but it is more probable the Phoenicians did around 1100 BC. Cádiz is famous for its Carnaval. The parties here are supposed to be more exuberant than anywhere in Spain, and resemble those of Río de Janeiro. As Carnaval is in February, we wouldn't know: we were here in June. 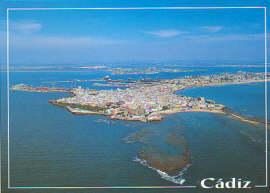 Cádiz is almost completely surrounded by the sea, as you can see on the postcard. Along the sea-boulevard there are lots of small beaches. In the hot summer, a dip in the Atlantic Ocean may be really refreshing. As the available space is limited, it is used efficiently: the streets are not wider than absolutely necessary. Because the design of the city is mostly from another century (or millennium), this means the wider cars have it difficult here. When we arrived in the city, we needed a place to park our car. We found one near the Calle de Capociño. What a coincidence: I just wanted a coffee. 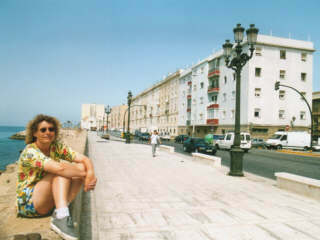 After that we did something anyone coming to Cádiz should do: a walk along the boulevard. Cádiz has a beautiful cathedral. After Sevilla, you may think the one in Cádiz is a bit small, but that is only in comparison. 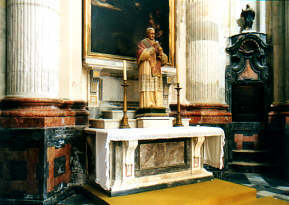 Cádiz' cathedral is in fact one of the largest in Spain. Of unexpected beauty is the crypt: a large circular space with several alcoves. 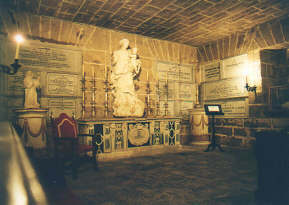 The graves of composer Manuel de Falla and the author José Maria Pemán are here.